Another pseudosimulator designed for virtual reality sets. 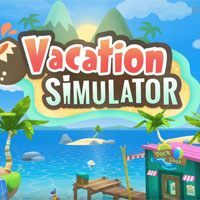 Vacation Simulator is another pseudosimulator developed by the independent studio Owlchemy Labs. Similarly to the previous work of this team, i.e. Job Simulator, the production went, among others, to the PC and PS4 platform. The action of Vacation Simulator takes place in a universe created for the needs of the aforementioned Job Simulator. Production takes us on a journey to 2050, when machines took over most of the responsibilities from people. After the protagonist of that production learned what work is, now is the time to find out what it is like to rest in a tropical resort. In the PC and PS4 Vacation Simulator released on the platform we observe the action from the perspective of the first person (FPP). Due to the fact that production requires virtual reality sets to work, we can freely look around by moving our heads, while using motion controllers we control the hands of the protagonist. The game consists in playing with robots (such as carefree bouncing the ball), as well as interacting with objects - for example, we can prepare a meal like a hamburger (meat must be baked on a grill beforehand) or a hot dog (which must be abundantly sprinkled with sauce). Vacation Simulator works on the basis of technology prepared for the needs of the previous work of the studio. The three-dimensional graphic design of this production has been maintained in cartoon style and rich colors, which fit well with the idyllic atmosphere accompanying the game.